This adapter is used to connect a truck that has the 7RV plug to a trailer that uses a 5 flat connector. The 7RV (also known as 7 spade) has 6 spade connectors arranged around a center pin. The 7RV plug is, for the most part, standard on all newer trucks and SUV's. The 5 flat connector has 4 female holes and 1 male pin. 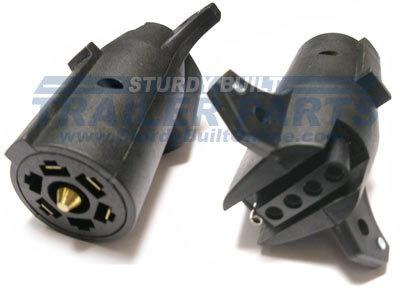 The 5 flat connector is commonly used on boat trailers with disc brakes. The additional pin is used so that when the tow vehicle is put in reverse it will send a signal to the solenoid to close, so that brake fluid can not go down stream to the calipers causing the trailer brakes to be applied. This adapter will run all lighting functions (brake, running, turn signals) and the extra wire that feeds to the solenoid. The solenoid gets its power from the center pin of the 7RV connector. Most newer vehicles have the center pin wired to become hot when the vehicle is put in reverse.